I just returned from a quick trip to Djibouti to visit our teammates at Camp Lemonnier and the Combined Joint Task Force Horn of Africa where it was a mere 86 degrees when I arrived. As I said, it was a quick trip but one I wanted to make to thank Rear Admiral Tony Kurta and his core staff members for the superlative work they have done over the past year. 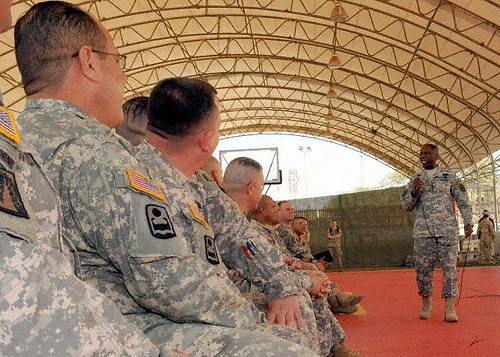 The outgoing core staff is made up of approximately 60 personnel, mostly Sailors, serving on the CJTF-HOA team for one year tours in Djibouti. They train for two weeks in Norfolk prior to arriving and beginning their sojourn in one of the most strategic locations in the world — the Horn of Africa. This group is the first core staff to work their entire tour under the command and control of U.S. Africa Command. They did an absolutely fantastic job of working with AFRICOM staff, interagency and international partners to help build the security capacity of the militaries of 13 East African nations. The work they do contributes to regional stability through cooperative security which leads to peace and prosperity for the people of Africa. The core staff is but one small element that supports the magnificent work of CJTF-HOA, but since their replacements are due to arrive soon and as they depart for their homes, families and new adventures, it made sense to me to stop in to see them. Another group that I had the pleasure of meeting with and speaking to was the 1-65 Infantry Battalion from Puerto Rico National Guard. This unit is deployed to Djibouti to perform the force protection function at Camp Lemonnier for one year. During my time with this great group of Soldiers I had the honor to promote three of their number from the rank of Specialist to Sergeant. Sergeants Moreno-Leon, Reyes-Martinez, and Pizon join the ranks of the non-commissioned officer corps – defining element of our military. I spent the rest of my time with these great Americans, thanking them for their service to our nation and to Africa Command. Through their selfless dedication to duty, Africa and the world community is a better place. This quick trip reminded me that these men and women and many others like them selflessly serve our great nation, in Africa and in many other places on earth, with very little recognition. It is important that I thank them and, through this blog, thank those who love and support those serving in places close to and far away from home. I consider it an honor. U.S. Army Gen. William "Kip" Ward, commander, U.S. Africa Command, speaks with the 1st Battalion 65th Infantry Regiment Puerto Rico National Guard, Jan. 26.